Kittens Gone Lentil: VeganMoFo 2016 #15: Taste the rainbow in a bowl. 15th: Multicolour – Fit as many colours as you can into one meal! I love a colourful meal. Shortly after the MoFo prompts were announced, I got my copy of the Oh She Glows Every Day cookbook. As I flicked through, the Glowing Rainbow Smoothie Bowl caught my eye, and I knew it was exactly the thing to make for my multicoloured meal! The base of this smoothie is a beautiful pink colour (ha, I can make food actually pink), thanks to a blend of watermelon, strawberry and some avocado. The avocado just adds a beautiful creaminess, not a strong flavour. 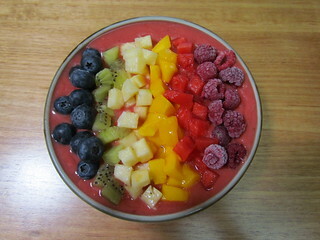 I followed the topping suggestions, except I swapped strawberries for frozen raspberries, but then there was watermelon, mango, pineapple, kiwi fruit and blueberries. So colourful! I had this for lunch one hot day after doing a bikram yoga class, and it hit the spot just right! It does melt very quickly, though. So take your happy snaps fast and then eat up! What is the most colourful meal you have made recently? My sweet, sweet Gizmo. 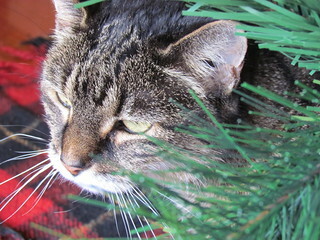 She is actually sitting under a Christmas tree here. She used to love sitting under the tree. She wouldn't try and pull anything down, she just wanted to sit underneath. Pink, finally! This looks really good. I was so happy to conquer pink!